The Cyprus International Tattoo Convention will take place for the third consecutive year in Limassol, Cyprus and aspires to become an institution. Pending the festival, HeartbeatInk Tattoo Magazine spoke with the team of Cyprus International Tattoo Convention and provides you with all the necessary information for the upcoming celebration of the tattoo in Cyprus. The festival will be hosted in Carob Mill Restaurants LTD, Richard Berengaria Ballroom and will run from Friday, April 1st until Sunday, April 3d. HeartbeatInk will be participating at the festival with its own stand. How did the idea of organizing a tattoo convention in Cyprus occured? The idea came up after watching for years all the big cities of Europe and generally around the world organizing tattoo conventions, giving the public the opportunity to see, experience and make contact with both local and international tattooists, to be able to talk with them and exchange ideas, and generally spent a nice weekend full of art and fun! It was something missing from Cyprus and something people wanted. What were the reasons that led you to the realization of the festival and how easy or difficult was its accomplishement? As a lover of the art of tattoo and having in account what mentioned above, the idea came to the table, and the concept of the tattoo convention took form; the first international convention in Cyprus. The implementation might sound and look easy but it’s not at all! It takes time, appetite, knowledge and teamwork! Our initial goal was to get our little Cyprus to know an event of European standards. We started timidly, and every year we make an effort to do a better job, with more attention, so as to always have a quality result. Until now what has been the most demanding part in the preparation of the festival? I would say the most demanding thing is the work before and during the convention in order to get a great result. Around 60 tattooers from Cyprus, Greece, Italy, Romania, Argentina, England, Spain and Scotland. What kind of individual events will be included in the organization this year? As every year, except for the part of the tattoo, we also have live performances; this year we will host some local bands (Crash N Burn, The Low Shark), as well as Nightstalker from Greece, John Wu presenting a new hip hop project, Dynarhymes airbrushing bodies, a well-known illusionist / magician from Liotati family and several other shows that will hold the interest of the audience - besides tattoos ofcourse! How is the world of tattoo in Cyprus? Can we dare to talk about a Cypriot tattoo scene? Naturally. There is a scene that evolves rapidly; talents that make amazing pieces while the response from the people is tremendous. Is there a response on behalf of the tattoo artists and is the festival popular among the public? Ithe response both form the tattooists and the people is huge. Some difficulty occurs with the reservations regarding the tattoo artists, cause the spaces are limited and there is not enough time for everyone. However, the attendance becomes bigger by the year. What are your expectations from the Cyprus International Tattoo Convention? Qualitative advancement and recognition in the wider world in order to host even better artists from abroad. 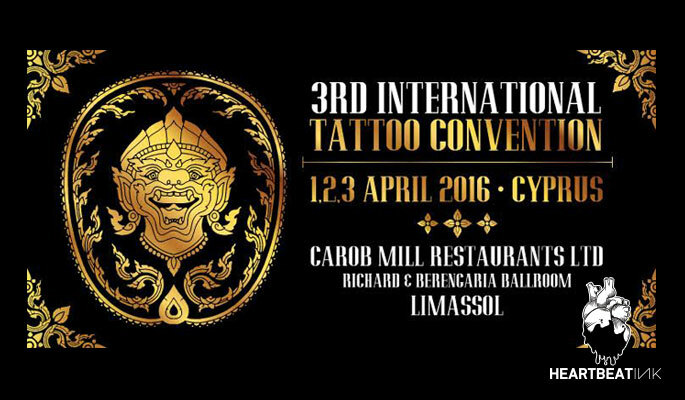 CYPRUS INTERNATIONAL TATTOO CONVENTION at Carob Mill Restaurants LTD, Richard Berengaria Ballroom, in Limassol. On Friday doors open at 13:00 and on Saturday and Sunday at 11:00.